A lawsuit against JP Morgan-Chase -- the nation's largest bank -- asserts that the institution paid off the $4,200,000,000 in mortgage forgiveness that it agreed to as a settlement for widescale mortgage and foreclosure fraud by committing a lot more mortgage fraud, in which homeowners, ethical lenders, and American cities were stuck with the bill. In the runup to the financial crisis, Morgan-Chase made a practice of refusing all requests for loan modifications by borrowers struggling with their mortgages. Instead of allowing these borrowers to refinance and stay in their homes, Morgan-Chase held them to the terms of their original -- extremely misleading and often mis-sold -- mortgages, which allowed the bank to increase their mortgage payments by 200-400% after the initial "teaser rate" expired. It was a sleazy deal from the start. Even after Morgan-Chase sold the loans, they still sent bills to the borrowers, and then kept thousands in payments they had wrongly diverted, telling Schneider that the accounting process by which it had misappropriated $47,695.53 was "not reversible." Morgan-Chase even sent sleazy, threatening debt-collectors after Schneider's customers, trying to get them to pay debts they didn't owe. But then came the settlement and the imperative on Morgan-Chase to start forgiving $4.2B in debt. The company began to send letters to Schneider's customers telling them they didn't owe anything anymore, despite the fact that Morgan-Chase no longer owned their mortgages. This was just the tip of the iceberg. Morgan-Chase also started to mass-forgive loans on houses that had long been abandoned by defaulting owners, who had been hounded out of their homes by ballooning mortgage payments and Morgan-Chase's unwillingness to modify their loans. 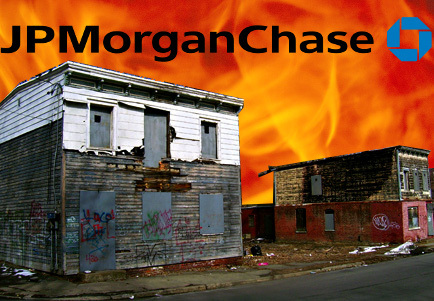 Because Morgan-Chase now owned these -- rotting, derelict, unlivable -- homes, they had to keep paying taxes on them, and make whatever minimum maintenance cities ordered to keep them from becoming firetraps or other hazards. When Morgan-Chase forgave the loans on these houses, the defaulted, homeless owners once again became responsible for these houses, which Morgan-Chase had allowed to fall into irredeemable disrepair. Now the victims of Morgan-Chase's foreclosure mill were de-foreclosed, they had to come up with thousands to pay the taxes and upkeep on houses that Morgan-Chase had ruined through neglect. When (predictably), these owners found themselves unable to pay for this upkeep, the cities -- who were now significantly down on their property taxes, remember -- were stuck with the bill for maintaining them. You may be asking yourself: how did Morgan-Chase get away with all these shenanigans, especially collecting on and then forgiving loans they didn't own? Good question, but it's got an obvious answer. According to Schneider, they used a firm of sleazy, Scientology-affiliated robosigners. tl;dr: Morgan-Chase used robosigners to steal houses. They were told to forgive $4.2B in mortgage debt to make good for this crime. They used robosigners to allow them to forgive debts that were not owed to them, and then they stiffed people whose houses they'd taken away with most of the rest of the bill for the $4.2B, and cities had to pick up the tabs that these homeless ex-Morgan-Chase customers couldn't pay.